Famed civil rights leader Dr. Martin Luther King Jr., who would have turned 90 years old on Jan. 15, was honored by San Diegans, including several University of San Diego campus community members, at multiple events held in his name throughout the county over the holiday weekend. 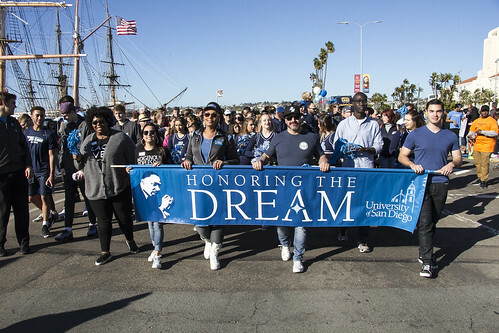 The university had representation at four King-inspired events in San Diego. On Jan. 18, USD President James Harris attended the 34th annual Dr. Martin Luther King Jr. Human Dignity Awards Breakfast, hosted by the Jackie Robinson Family YMCA at the Town and Country San Diego Grand Exhibit Hall in Mission Valley. 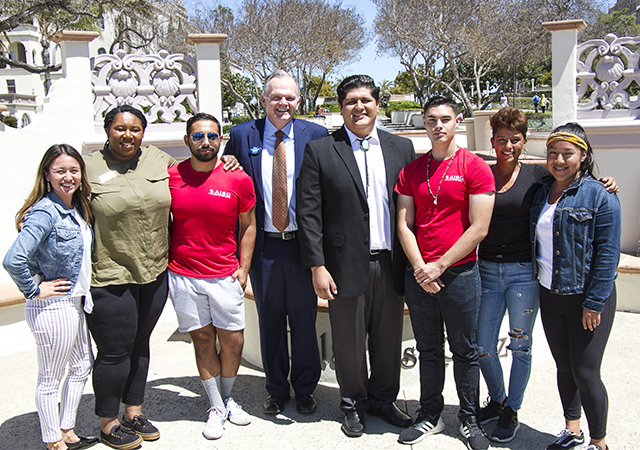 President Harris tweeted from his @usdpres Twitter handle his congratulations to the winners of the Youth Art and Poetry Tribute Awards and was inspired by the story of the recipient of the Human Dignity Award, The Tariq Khamisa Foundation. “The story … is an inspiring example of healing and reconciliation for our society. A well-deserved recognition,” Harris tweeted, along with a picture. The Dr. Martin Luther King Jr. Educators’ Breakfast was Jan. 19 at the Jacobs Center for Neighborhood Innovation. Coordinated by the Zeta Sigma Lambda Chapter of Alpha Phi Alpha Fraternity Inc., the oldest African American fraternity in America and targeted to local university leaders, teachers and students, the event included President Harris, USD Associated Students President Natasha Salgado and Associate Vice President for Community Engagement, Chris Nayve in attendance. On Monday, the official holiday to celebrate Dr. King, consisted of two big events in the city. Those in attendance from USD included AS President Natasha Salgado, Graduate Student Council President Breana Clark, faculty members Dr. Alberto Pulido (Ethnic Studies), Dr. Evelyn Diaz Cruz (Theatre and Performance Studies), Dr. Thomas Reifer (Sociology), Dr. Gail Perez (Professor Emerita/Adjunct Lecturer of English), School of Law Outreach Coordinator Patty O’Deane, Community Engaged Learning Director John Loggins of the Mulvaney Center for Community, Awareness and Social, USD alumna Corin Thornburg and Community and Government Relations Director Malia Pfister. The afternoon concluded the weekend of events as the 39th annual Martin Luther King Jr. Downtown Parade. 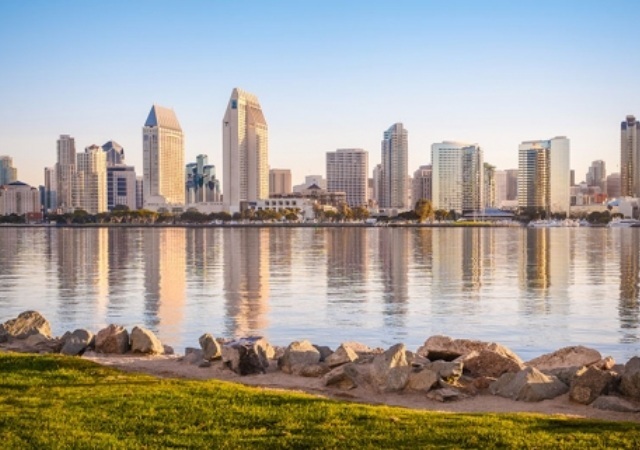 Coordinated by the Zeta Sigma Lambda Chapter, the University of San Diego was well represented by its campus community. 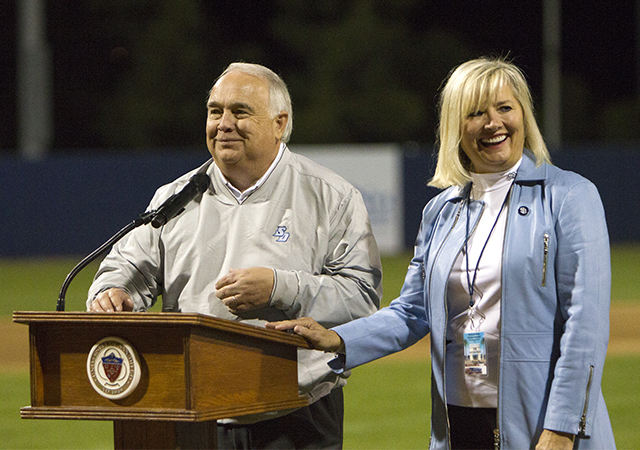 Student-athletes from basketball, softball, tennis, swimming, rowing, the Torero Spirit Team and mascot Diego Torero joined President Harris, AS President Salgado, GSC President Clark, Shiley-Marcos School of Engineering Dean Chell Roberts, Associate Vice President and Executive Director of Athletics Bill McGillis, Senior Associate Director of Athletics for External Affairs/Senior Woman Administrator Marcy Lanoue, Military and Veterans Program representative and current student, retired Marine Corps veteran Simon Sandoval, and Senior Director of Alumni Relations, Charles Bass, to be among the approximately 200 Toreros walking in the parade route along Harbor Drive. Photos by Ryan T. Blystone, Allyson Meyer, Malia Pfister and Yvette Williams.